It was while working on the ferry piers for the Bristol and South Wales Union Railway in 1862–63 that Charles Richardson first began to pursue the idea of replacing the ferry with a railway tunnel beneath the estuary. However, it took him three attempts, over a period of ten years, to get the plan accepted. His first approach, in 1865, was rejected because the GWR were in the process of seeking an Act of Parliament for a project, proposed by John Fowler, for a new double track, mixed-gauge railway, 41 miles (70 km) long, from Wootton Bassett to Chepstow, crossing the Severn at Oldbury Sands. And by 1869, Richardson’s scheme also had competition from two other tunnel proposals. Richardson’s estimate for his tunnel, and for the short lengths of railway at either end, was £730,000. The tunnel’s chances of success improved dramatically when, in 1870, the newly elected chairman of GWR, Daniel, later Sir Daniel, Gooch, denounced the Fowler project (see previous paragraph) as an extravagance. Apparently he had come to realise that the director who had been pressing the case for this project at Board meetings, had been doing so to further his own interests. After further lobbying, Richardson’s scheme was adopted by the GWR Company in 1871 and, the following year, the Severn Tunnel Bill was approved by parliament. Construction began in 1873, with Richardson as Chief Engineer and with John (later Sir John) Hawkshaw as Consulting Engineer. The construction of what would become the longest railway tunnel under water in the world at that time, turned out to be a classic example of an engineer’s extreme fight against adversity. It is surely the leviathan of all Victorian railway tunnels and one of the nation’s finest engineering achievements. An excellent and detailed account of the works is contained in the book written by Thomas Walker, the contractor who assumed responsibility for their completion, after progress under Charles Richardson stalled, in 1877. The description of events, given below, is based on information obtained from that book. The original intention had been to put the work into the hands of an experienced contractor but Richardson was not satisfied with any of the bids he had received from contractors. He was convinced that, by using the GWR Company’s own direct labour force, he could complete the job for 25% less than would be the case if he accepted any one of the bids he had received from contractors, and so he decided to go ahead on that basis. However, four and a half years later, all he had achieved was one winding shaft and 1,600 ft (490 m) of 7 ft by 7 ft (2.1 m x 2.1 m) heading under the river. In August 1877, the Directors of GWR intervened and instructed that tenders should be invited for the remaining works. Only three tenders were received in response to the new invitation and Hawkshaw, acting as consultant, recommended acceptance of the tender from Thomas Walker, an experienced contractor in whom he had full confidence. However, the Directors took the view that Walker was asking too much for contingencies. In order to minimise their exposure, should a disaster occur, they decided not to enter into a contract with him until the ground had been proved by the completion of the 7 ft x 7 ft heading right through the length of tunnel under the river. In the meantime, the heading was to go ahead using direct labour. Certain other relatively small items of work were also allowed to proceed, some by using smaller contractors, others by direct labour. The pace of the work picked up significantly but, on 18 October 1879 when the headings, that were approaching each other from either side of the river, were only 138 yards (125 m) apart at the east end, a great inrush of water occurred at the west end. Within 24 hours, water had filled the works on the west side, up to the level of the tide. Fortunately, the safety measures that had been put in place, enabled all the men working in the tunnel to escape with their lives. There is little doubt that all the men who ran for their lives on that day were convinced that the river had broken into the tunnel. However, when the initial shock had subsided and it became possible to rationalise events, it became clear that the point at which the water had broken in was not under the estuary itself but a short distance from the west bank. We now know that the influx of water came from the “Great Spring”, a major aquifer that carries extremely pure water down from the Brecon Beacons and directly into the Estuary below low tide. To day, over 130 years later, 20 million gallons (90 million litres)of valuable spring water are still being pumped out, each day, from the point at which the tunnel had had been cut into this aquifer. At the time, this flow represented the daily intake of either Liverpool or Manchester – or about one sixth of the consumption of London. The ingress of the Great Spring, no doubt, caused GWR Directors to ponder their previous statements about the amount requested by their chosen contractor for contingencies. Their reaction, to what had happened up to that point, was to invite Hawkshaw to take full charge of the works, as Chief Engineer, with authority to act as he thought fit. Hawkshaw intimated that he was prepared to accept, but on condition that he be allowed to let the works to Thomas Walker. The Directors concurred but still wanted the length of 7 ft by 7 ft heading to be completed under the deep channel known as “The Shoots” before any major works were undertaken elsewhere. They asked Hawkshaw to seek a price for this element, alone. Walker responded, suggesting that his 1877 tender should still stand, though modified to allow for the lapse of time and the amount of work still to be done. He was prepared to concentrate on completing the heading under the river, as soon as he had dealt with the influx of water and pumped the workings dry. This suggestion was agreed by all parties and the works were handed over to Walker on 18 December 1879. The events described above inevitably led to the departure of Charles Richardson from the project. Great credit is due to him for the conception of the scheme and for its safe passage through the unpredictable Parliamentary procedures. He also developed a system for successfully aligning the two headings with unprecedented accuracy. However, while his administrative and conceptual expertise remained untarnished, his ability to drive a difficult project through to fruition, had been called into question. The extent to which his difficulties stemmed from a lack of expertise or commitment on the part of the GWR direct labour force, is difficult for us to judge in the 21st century. But before Richardson leaves the stage, it is worth mentioning that generations of boys, both young and old, should be grateful to him for conceiving the idea of inserting three layers of rubber into the cane handle of a cricket bat, a device that soon became adopted universally and is still employed, worldwide. It is on record that several of his professional colleagues, including Brunel, often complained about the amount of time that he spent playing cricket! In January 1880, while Walker was setting up and organising pumping operations, Hawkshaw decided to lower the position of the tunnel under the Shoots Channel by 15 ft (4.6 m), preserving the previous gradient of 1 in 100, eastwards towards Bristol, but increasing the gradient westward to 1 in 90. It was possible to make this change without incurring large additional costs because the almost completed heading would still be wholly within the template of the amended tunnel. The greater security that this represented, against the threat of the river inundating the works, allowed him to authorise Walker to commence work at other points. Walker was then able to put in hand arrangements for recruiting and housing a very large work force (the maximum number employed, at any one time, eventually reached more than 3,900). The immediate task was to seal off the heading into which the spring water had entered. Although the heading itself was quite short and wholly under dry land, it interconnected with the main heading in the Sudbrook pumping shaft. This meant that a shield had to be positioned in the shaft to seal off the problematic heading on both sides of the shaft. Like so many other operations involved in the construction of the tunnel, the task was bedevilled by practical problems and pump breakdowns. Divers were called upon to perform superhuman feats at what were extreme depths for the best survival equipment available at that time. A good example of this came about when Walker realised that, in order to clear all the water from the Great Spring out of the tunnel, it would be necessary to close an iron door in a headwall that had been left open, inadvertently, when the men evacuated tunnel on the day the inundation occurred. The job was given to his most experienced diver, who had to negotiate all kinds of obstacles in walking for 1,000 ft (310 m) though the flooded heading, all in darkness. The diver’s air pipe was connected to a static pump at the start point which meant that a very long length of pipe had to be dragged out behind him. And because the water in the heading was under considerable pressure, the air pipe pressed hard against the top of the heading, producing a great deal of friction. Even with several assistants to help convey the air pipe forward, the diver was unable to complete the assignment. The problem was only overcome when the engineers discovered that a Wiltshire man, named Henry Fleuss, had just developed a new type of diving helmet that connected directly to a cylinder of compressed oxygen strapped to the diver’s back – a very fortuitous piece of timing. The Great Spring was eventually contained behind a long ‘cement’ headwall, 8 ft (2.5 m) thick, into which a door had been inserted. At a later stage, pumps were installed to take the water away to prevent it causing further damage – and to take advantage of the commercial potential thus available. At the end of April 1881, when the process of ‘breaking up from the initial 7 ft by 7 ft (2.1 m x 2.1 m) heading to the required dimensions of the tunnel was underway on the Gloucestershire side, water suddenly burst in from the roof of the tunnel near the Sea Wall shaft. This time it was sea water; the river had broken in! Fortunately the hole, which was close to the bank on a stretch of water known as the Salmon Pool, was not very large. The shape of the surrounding rocks was such that the Pool retained a minimum of 3 ft (1 m) of water even at low tide, making it impossible to locate the hole by sight. A number of men were called upon to walk slowly across the area, holding hands as they went, until one fell into the hole and had to be pulled out by his colleagues. The water was allowed to rise in the tunnel to the same level as the river itself and then, at high tide, a schooner was loaded with puddle clay and moved into position so that the hole could be plugged, using alternate layers of bagged and loose clay. In December 1882, a major incident occurred, causing more than three hundred men to abandon their possessions and stampede out of the tunnel, shouting “The River is in”. When the initial panic subsided and it it became possible to carry out a preliminary assessment, it became clear that the situation was not as bad as feared. In fact, the expected flooding of the tunnel did not occur. After a thorough investigation, it became clear that the panic was caused by a sudden surge in water from the Great Spring which had been damned behind a berm in an upper heading. The level of this water had risen steadily and, after over-topping, it had washed it away the berm and surged into the lower heading. The men’s reaction was hardly surprising, given the conditions under which they were working. They naturally assumed that their worst nightmares were about to be played out. On the 9th of February 1883, a terrible accident occurred as men on the night shift gathered round the bottom of a lift shaft, waiting to be brought up for supper. Four or five men had just entered the cage at the bottom, when an iron skip at the top of the shaft was inadvertently allowed to move over the lip and fall 140 ft (c 45 m) on to the cage below, killing three men before bouncing into another group, standing by, where another man was killed and two seriously injured. There was another emergency on 10 October 1883, when a great surge of water entered the works from the Great Spring, very much exceeding the capacity of available pumps. It swept the men and their iron skips, like so many chips, through the door leading out of the heading and into the finished tunnel, where the men were able to recover. None of the men were seriously injured but three colts were drowned. Headwalls were rapidly built to contain the flood, as water rose up against the pumps to a height of 52 ft (16 m). At first, it seemed that the works might have to be abandoned as all the available pumps, working to capacity, failed to make any headway against the floodwaters for several days. But eventually, the pumps slowly but perceptibly started to gain the upper hand, much to the relief of everyone involved. It seems that water from a nearby subterranean reservoir had suddenly been released but fortunately proved to be more manageable than seemed likely. It has been calculated that the maximum flow during this incident must have been about 27,000 gallons (c 125,000 litres) a minute, 16,000 gallons (c 70,000 litres) more than the available pumping power could lift. Never the less, the Great Spring had been safely imprisoned again by the 3rd November. Then, on the night of the 17th of October 1883, only a week after the Great Spring had renewed its assault, a tidal wave flooded the low lying area on the Sudbrook side. On a night when one of the highest tides of the year was expected and, during an exceptional storm, a tidal wave described as a solid wall of water, 5 or 6 ft high, swept in and entered the living accommodation provided for the workforce. About 90 men had just descended the Marsh shaft to continue opening up the heading into a full tunnel, near the western portal, when flood water over-topped the mouth of the shaft and fell into the workings. Three men attempted to climb a ladder out of the shaft in order to escape from the flooded works beneath; two emerged unscathed but the third was thrown off the ladder by the weight of falling water and killed. The water rapidly flooded the area at the base of the shaft, driving the men up the completed tunnel which rose at a gradient of 1 in 90. In the meantime, a workforce was rapidly gathered on the surface to build a make-shift wall around the top of the shaft in order to prevent additional water entering the works. Then a small boat was lowered down the shaft, to ferry men back to the base of the shaft where the water had by then risen to within 8 ft of the crown of the tunnel. Some had to wait hours for their turn in the boat but, by the morning of the 18th, the last remaining survivors emerged. The incidents described above, and many other unexpected difficulties that bedevilled the operations, are all vividly described in Walker’s book, each one requiring men to work at the limit of human endurance and ability, while using the most advanced technology available at that time. On several occasions, it seemed that the task would prove to be beyond the capability of the men responsible but, with outstanding skill and perseverance, they managed to overcome the obstacles and complete the task. The first train journey through the tunnel took place on 5 September 1885. A special coal train ran through from Aberdare to Southampton on 9 January 1886, but it was not until the end of 1886 that the tunnel was opened to regular traffic. The construction of the 4 mile 628 yd long tunnel took almost fourteen years to complete. The final cost was £1,806,248, two and a half times Richardson’s original estimate and nearly double Walker’s 1877 contract price. The opening of the tunnel for regular passenger services on 1 December 1886 marked the end of Brunel’s unique steam ferry railway, the last crossing by the steam packet taking place the previous evening. Over thirty years later, a ferry was re-introduced at New Passage, this time in order to transport cars and other road vehicles across the Estuary. And later, with the inexorable growth in the car use after the Second World War, British Rail introduced an occasional piggy-back car-carrying service, through the tunnel. Both these services ceased when the Severn Bridge opened on 8 September 1966. In 1844, Brunel started to consider the possibility of reviving the direct route across the Severn, via the New Passage, by bringing together the convenience of a railway and the flexibility of a steam ferry. The idea had much to commend it but, for various reasons, it did not get underway for another 14 years. Brunel himself was involved from time to time, although he was also working on many other projects during this period. The first positive proposal along these lines, known as the Bristol and South Wales Junction Railway, was approved by Parliament in 1846. It comprised a branch line from Bristol to the pier at New Passage, a further short length of track on the opposite side of the Estuary to connect from the ferry pier at Portskewett to the SWR, and a ferryboat to run between two piers. The timber piers, designed by Brunel, were to be approximately 500 ft (155 m) long to accommodate the full length of the train and to reach out into the deeper water. Financial problems led to the abandonment of the scheme in 1853. Another project based on a similar principle and entitled the Bristol, Wales and Southampton Railway was brought forward in 1854. It proposed to use a “steam bridge” across the river at the same point – with the railway carriages being hauled onto the ferry boat, thus allowing people to stay in their seats. This project also failed from a lack of investment. Finally, a scheme was brought forward by the new Bristol & South Wales Union Railway Company (B & S W U R), this time with strong Welsh backing and with the chairman of the SWR on board. A public enquiry was ordered by the Admiralty and it opened in the New Passage Hotel on 25 March 1857. Opposition was raised by the City of Gloucester and the Gloucester & Berkeley Canal Company, as well as owners of small craft and the steam packet Wye, that ran between Chepstow and Bristol. Those who opposed the scheme had the mistaken impression that a chain ferry would be used. Brunel, who had become engineer for the project in 1855, explained that this was not the intention; the project would be based on a train ferry and confined to passenger and light goods only. An Act of Parliament for the B & S W U R was obtained in July 1857. Brunel is on record as saying that he believed there would be a bridge or a tunnel across the estuary within fifty years. Although the Duke did not take the matter further, Brunel obviously kept the exchange in mind because, in April 1857, probably while attending the public inquiry into the B & S W U R, he made a sketch of a design with obvious similarities to that of the Tamar Bridge. Under the drawing, Brunel had written ” Severn Bridge. Q: is 1,100 ft practical”. In September 1858, a contract for the 11½ miles (18 km) long single line railway from Bristol to the estuary was awarded to Rowland Brotherhood, with Charles Richardson as resident engineer, working under Brunel. From the junction with the existing railway, ½ mile (1 km) east of Temple Meads Station, the line would include five local stations. The piers leading into the river were the most innovative items, incorporating floating pontoons at the ends of the timber piers on to which the trains would run, with stairs and lifts down to the pontoons. The piers extended far enough out to provide sufficient water for the steam ferry boat to come alongside at any state of the tide. The pontoons floated with the tide and were therefore at the same level as the boat when it came alongside. Sadly, Brunel died in 1859. The full system from Bristol to New Passage, across the ferry, then on to the link to the SWR, for Cardiff, was achieved by November 1863, with the formal opening taking place in January 1864. Initially, there were five trains a day, each way, and a single ferry, called “Relief”. The route became so popular that other vessels were used from time to time to provide additional capacity. Eventually, a second ferry was ordered from the Glasgow shipyard and named “Christopher Thomas” after the chairman of the company. Throughout recorded history, until well into the Industrial Revolution, the most efficient method of transporting heavy goods was by river and coastal water. It is, therefore, not surprising that the majority of large urban settlements in all parts of the world are located in close proximity to an effective waterway. The River Severn is the longest river in Britain. It played a crucial role in the economic development of the post-medieval nation. Prior to the development of canals, it carried a greater volume of traffic than any other waterway in Europe. Rising on the slopes of Plynlimon Fawr, it meanders through central Wales as far as Shrewsbury and then turns south, passing under the famous Iron Bridge at Coalbrookdale and several bridges designed by Thomas Telford. His bridge at Over, just downstream of Gloucester, was opened in 1830 and remained the lowest road crossing of the estuary until the M4 motorway was opened in 1966. The golden age of water-borne transport came immediately before the coming of the railways, when all possible use was made of this mode. By 1800, small river craft were able to navigate up the river as far as Shrewsbury; while Bewdley was considered to be the upper reach for larger vessels. With the construction of new waterways such as the Staffordshire and Worcestershire Canal which gave access to the Black Country, the Severn played an even more important role in the economy of the region. Access up as far as Gloucester, was improved by the opening of the Gloucester to Sharpness Canal in 1827, after a tortuous gestation. During the late 18th century, most roads in this country were in such a poor state that manufacturers often had to go to very great lengths to transport their goods. An example of this was the route chosen, in 1775, by a company from Wellington in Shropshire to deliver a consignment of pig iron to Chester, 60 miles (97 km) further north as the crow flies. The journey began with the iron being transported by cart to the Severn, to be loaded on to Bristol-bound riverboats. On arrival in Bristol, the material was transhipped to sea-going vessels and then taken right around the coast of Wales, into the mouth of the Dee, and so to Chester. This example, involving a journey of over 400 miles (644 km) by water with two trans-shipments, speaks eloquently about the state of the roads at that time. Ancient crossings of the lower Severn estuary. Crossing the river has always been hampered by the high tides and fast currents, causing a real problem for all the peoples who have inhabited its boundaries. An ancient crossing route has been identified from the end of an ancient ridge-way over the Cotswolds to Shepperdine on the English side and onto the Beachley peninsula on the Welsh side. After the retreat of the ice, this route would have been used by the first settlers, their primitive rafts taking advantage of the tidal flows to go E-W on the ebb and W-E on the flow. This crossing probably survived through the Roman period and into mediaeval times, as indicated by the location of the southern end of Offa’s Dyke, part way down the Beachley Peninsula. No record survives of the efforts made in early times to provide a regular ferry service but there is archaeological evidence indicating shipping trade across the Estuary. The first record of a regular ferry is from AD 1131. It was used by monks at Tintern Abbey, under a grant from Winebold de Balon who owned the land. The ferry plied across at the narrow point between Aust to Beachley. This ferry route was maintained down the following centuries and is known as the Old Passage. The alternative ferry route, across the English Stones, might, in fact, be the older of the two. However, it was closed by Cromwell, following the drowning of Parliamentary troops marooned on the English Stones in 1645. After it reopened in 1718, it became known as the “New Passage”. “The sea was so broad, the fame of the Bore of the tide so formidable, the wind also made the water so rough, and which was worse, the boats to carry over both man and horse appeared so very mean, that, in short, none of us cared to venture. So we came back, and resolved to keep on the road to Gloucester”. The route from the west bank of the Severn, opposite Bristol, through South Wales was in a poor state of repair throughout the eighteenth century and frequent calls were made for its improvement. Reductions in journey times became of pressing importance in the 18th century, as markets increased in scale and reach with the establishment of Empire and the impact of the Industrial Revolution. By the early 1800s steam pickets were plying between West Wales and Southern Ireland. In 1823, the Post Master General sought to improve the Mail Coach route between London and Milford Haven and he called upon Thomas Telford to advise on what should be done. The advantage of replacing the long diversion around Gloucester whenever the ferry services were interrupted was evident to Telford and he believed that the value of the reduced journey times would justify the building of a permanent crossing. In modern times, major estuarial crossings have far outstripped other public works in economic gain, providing returns in the region of 200% in the first year alone. “One of the most forbidding places at which an important ferry was ever established, a succession of violent cataracts formed in a rocky channel exposed to the rapid rush of a tide which has scarcely an equal on any other coast“. Telford’s first proposal was a crossing from Uphill Bay in Somerset to Sully Island on the west side of Cardiff (this is similar to the line of the proposed Severn Barrage). It is possible to imagine Telford staring across the swirling waters in awe and excitement at the prospect of engineering such a structure and the wealth it would generate for the area. However, the proposal was rejected. Telford then considered the Old Passage which crossed at the narrowest point on the estuary. At that time, his two suspension bridges were in the course of construction in North Wales, so it came as no surprise when, in 1824, he suggested a similar solution for the Severn at the Old Passage. However, his suggestion was not taken forward because, at that time, the route to Dublin via Holyhead carried more political clout than the South Wales route to southern Ireland. Nevertheless, on 26 November 1825, plans were announced for improvements to the Old Passage, including a new ferry and improved landing facilities on both sides of the estuary. Before moving on, the reader might be interested to learn about the existence of an old and historically-important road bridge situated less than 3 miles (5 km) from the western end of the Severn Bridge. To the historically minded, the name of Chepstow conjures up visions of the medieval castle and Brunel’s magnificent Railway Bridge. 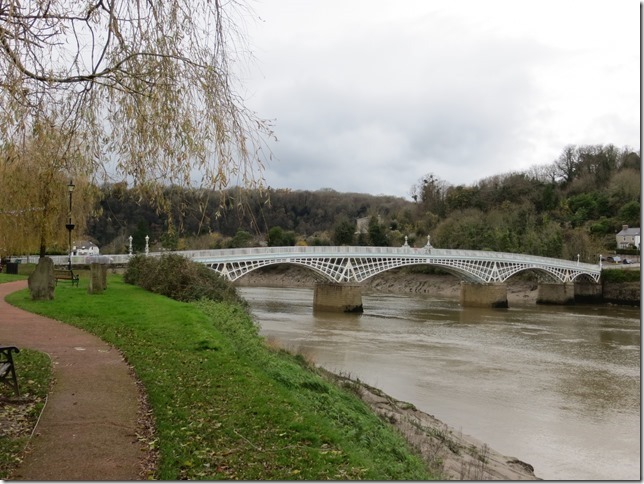 However, just upstream from the new Wye Crossing at Chepstow, there is a very interesting Grade One listed, five span, cast iron bridge which passed its 200th Anniversary in 2016. Carrying the main road from Gloucester to South Wales, it was built to replace an older, wood and stone, bridge that had been struggling to cope with the prevailing conditions on the River Wye. The tidal range at the Chepstow Bridge is only marginally less than that at the nearby Severn Bridge which, at 40 ft (14 m), is the second highest in the world. This means that, for long periods every day, the view of the bridge on the water is constantly changing as water rushes up and down. The bridge has five spans so there are four piers in the river that navigators need to avoid. In 1811, in response to a request for bids to replace the old bridge, Watkin George of Cyfarthfa, Merthyr Tydfil, and John Rennie had each prepared designs for new cast iron spans on the existing piers and Rennie also prepared a design for a 250 foot (76.2m) span cast iron arch flanked with 72 foot (22m) span masonry arches. These bids were all rejected, mainly on grounds of cost. In 1812, a collision occurred between a vessel and one of the piers, causing 6 deaths and significant damage to the bridge. This proved to be the catalyst for action. The foundation stone for a new bridge, at the same location, was laid in 1813. The following year, a contract to design and construct the new bridge was let to John Urpeth Rastick, Robert Hazledine, Thomas Davies and Alexander Brodie of Bridgenorth Ironworks. Rastick was responsible for the design of the bridge and he supervised its construction. Some of the ironwork was cast at Calcutts Ironworks in Shropshire, which was owned at the time by Brodie, and later by Hazledine. The central span of the bridge is 112 ft (37 m) long and it is flanked by two 70 ft (21.6 m ) spans and then two end spans of 34 feet (10.5 m). The overall length is about 487 ft (149.4 m) and it is 20 feet (6.1 m) wide. The piers and the abutments from the previous bridge were reused after being strengthened by a surrounding cover of large rectangular stone blocks (ashlar). The deck for each of the graduated spans is supported by five, shallow lattice, cast iron arches (three of the outer lattice arches are visible on the photograph, below) and these elements, together with the vertically curved road profile and the decorative lamp standards, all contribute to the bridge’s attractive appearance. The Chepstow Museum holds various prints of older bridges that had spanned the river at this point. The bridge was opened on 24th July 1816. The original contract price was £17,150, and the total scheme cost, including fees, was £22,116. This was less than half of Rennie’s earlier bid. 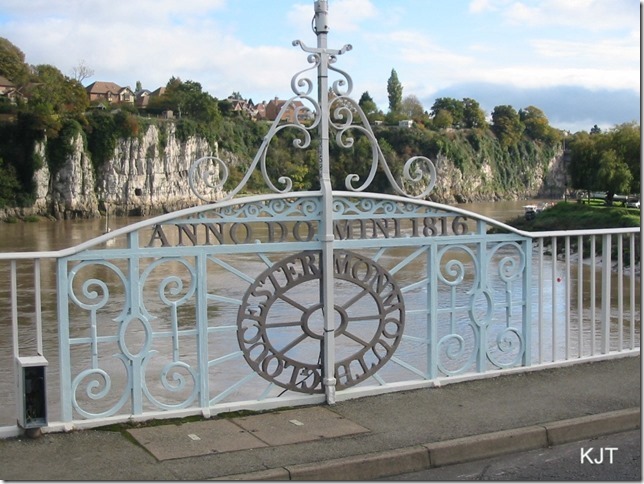 The centre span was strengthened by the addition of steel ribs in 1889 and further extensive repairs and reinforcement were carried out in 1979-80. When built, the new structure became the third largest cast iron bridge in the world. It is now the largest surviving bridge of its type and era. The bridge carried the only trunk road into South Wales until 1988, when the Chepstow Inner bypass was opened. It continues to carry local traffic across the river. The design is generally considered to having been inspired by the work of Thomas Telford who built several cast iron arch bridges that can still be seen in Mid and North Wales. It therefore provides an opportunity for visitors to the area to see what Thomas Telford would probably have provided, had he been called upon to do so. Rastick [1780-1856] is better known as a railway engineer and locomotive builder. He helped Richard Trevithick develop his ideas for steam engines and built a locomotive for him in 1808. In 1829 he built the first steam locomotive to run in the USA. In 1829, he chaired the judging panel at the Rainhill Trials for the Liverpool and Manchester Railway which led to the approval of Stephenson’s “Rocket” and he built many railways in Britain, including the London & Brighton Railway.